According to a study by the University of Glasgow, dogs have individual tastes in music – just like humans – in that they react differently to rock, pop or classical music. This insight inspired the idea to create the website and online campaign “Adoptify” to bring shelter dogs together with potential owners based on their individual musical tastes. Teaming up with the animal protection organisation Tierschutzverein München e.V. and the music streaming service Spotify, the campaign emerged as a new way of adopting shelter dogs. Assigned to specific genres of music, including electro, classical, pop, rock and hip-hop, the dogs are featured in short videos portraying them in cool poses and performing witty, dance-like movements to their favourite music. 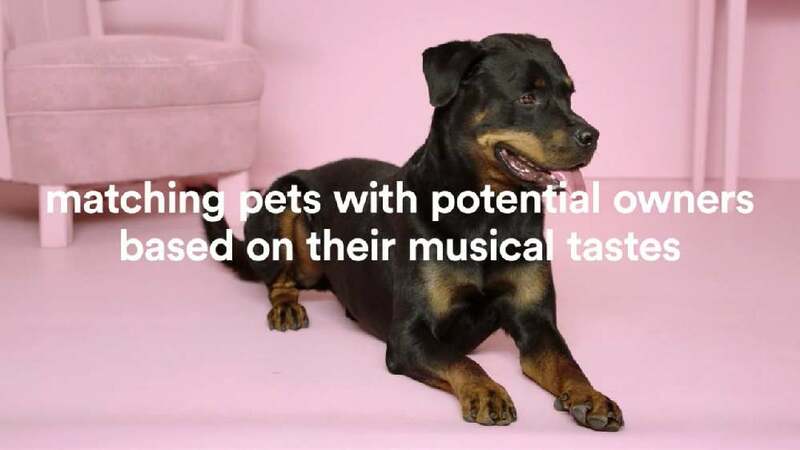 These videos were then shown in banners to users of Spotify while they listened to their favourite music, suggesting dogs to them whose taste in music matched their own. Within one week, all featured dogs had been adopted by people who shared their love of the same music. Thanks to the huge response to this campaign, shelter dogs all over the world now have better chances to find a new home. The strategy of making dogs more attractive for adoption by using music as a possible point of relation is very clever and highly effective. The concept of “Adoptify” is well thought-out and impresses with both the fantastic, appropriately cheesy colour palette and the quality of the dog feature videos, which instantly appeal to the viewer. All in all, the message is thus conveyed in a skilful manner and, above all, with humour and wit.